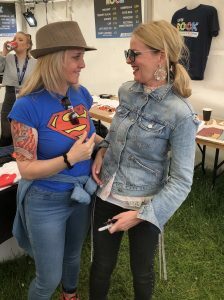 Kirsty Baird (MD) and members of Sing in the City had a day out at the Lets Rock 80’s festical on the 23rd June in Dalkeith country park. Clare Grogan was one of the acts. It’s the second time Kirsty has seen Clare perform as she went to the Midge Ure gig at the Edinburgh Playhouse where Clare was one of the support acts. If you look at Clare’s hand there is a Sing in the City business card there, will she respond to the ‘come sing with us’ request?